Let's face it. 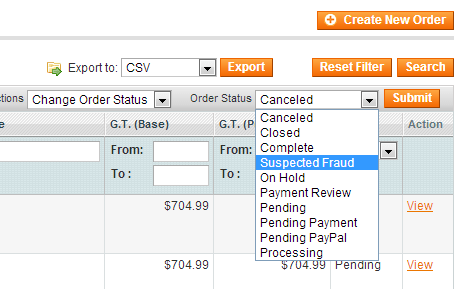 Magento's order status system is limited out of the box, and especially not very transparent for your customers. Fix this using the Advanced Order Status extension by XTENTO. Make your order processing more transparent for your customers, and for you, the store admin. 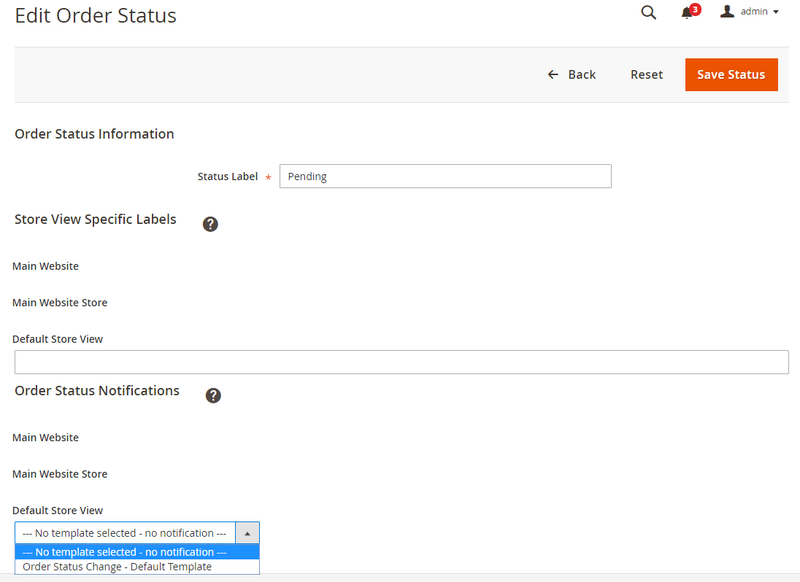 This extension allows you to add custom order statuses and to dispatch email notifications using templates to customers whenever you change the order status in the Magento backend. 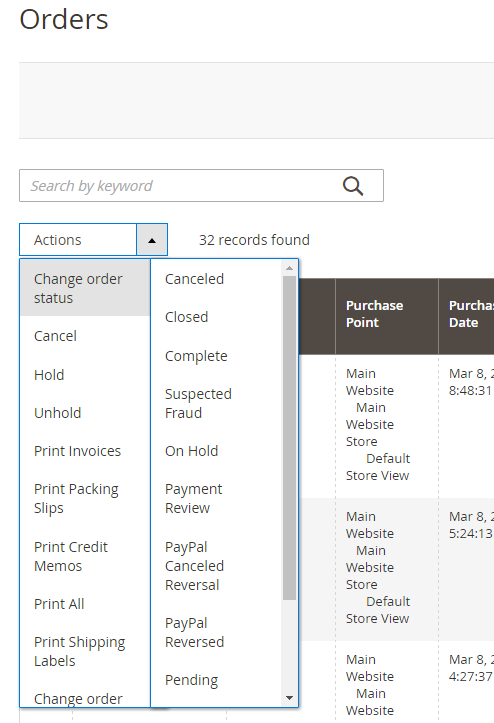 Easily change the order status to any order status right from the Sales > Orders grid. With Magento's built-in order status system, an unlimited number of new statuses can be created right from the Magento backend, to set up more precise statuses in Magento and to let your customer know what's going on with their order. Promotion: Purchase this extension today and have us install it for you - at no extra cost! After placing your order simply send us your (S)FTP/admin logins and we'll install the extension for you in one Magento installation. Does not include configuration. Limited time offer, you save $55. 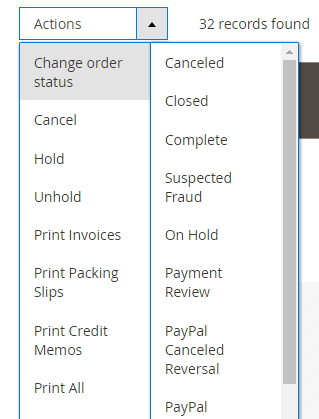 Want to change the order status for an order? No problem! You can do so right from the Sales > Orders grid using this extension. You can change the order status of an order to ANY status, for example from "Processing" to "Complete". Set up an email template using the Advanced Order Status extension, assign it to a status, and your customers will automatically always get an email when the order status changes to Complete, for example - letting them know that their order has been completed for example. Make order processing more transparent. Set up new order statuses. Communicate the current order status to your customers. Change the order status for orders in bulk. All using this extension. 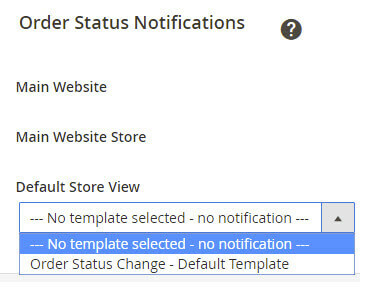 Whenever you change the order status to a status with a notification attached, the configured email template will be sent to the customer. 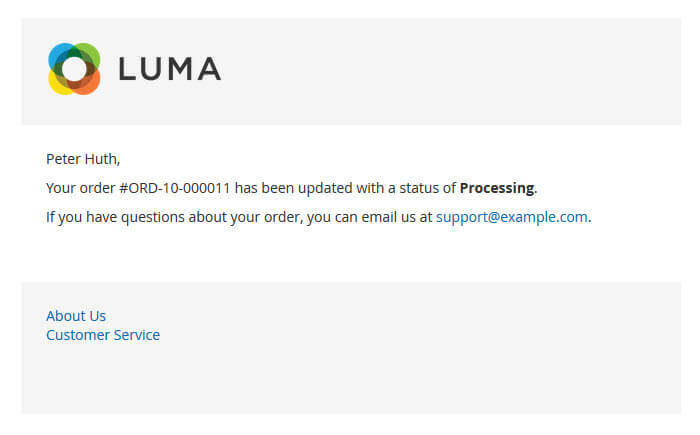 A sample "order status update" template comes with the extension out of the box. Different email notifications can be set up for each status and store view. E-Mail notifications can be sent to the store owner in copy. Don't want to send email updates when changing the order status? No worries, simply don't assign an email template to your order status. 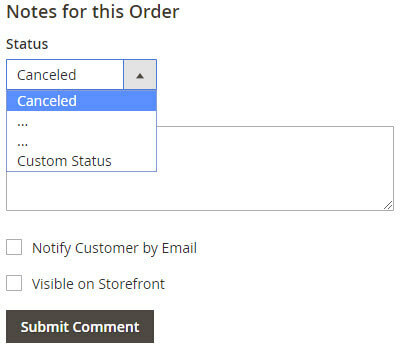 Easily change the order status right from within the order screen when adding a comment to an order, with the ability to select all order statuses - not just the "current" status, like in Magento out of the box. 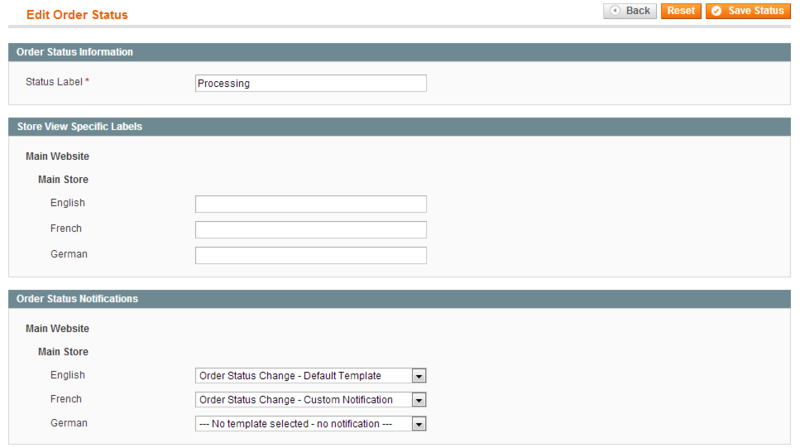 Changing the order status can then notify your customers, if required. Create new statuses to communicate the current order status more clearly. Set up as many order statuses as required to make order processing more transparent for your customers. Order statuses are shown in the frontend as well. Assign colors to order statuses, shown on the Sales > Orders grid. Easily flag orders for your customer reps so they see which orders need special attention - fraud, express shipping, etc. Need to process orders in batches? Right from the Sales > Orders grid? Check out our Simplify Bulk Order Processing extension if you want to process orders in batches right from the Sales > Orders grid. The two extensions are a great combo! Another great extension! Well done guys! All extensions were built by Magento Certified Developers. Our extensions are not encrypted (no IonCube, Zend Guard, etc.) and not obfuscated. 100% of the extension source code is "open source" and not a single line of code is obfuscated / encrypted. Easy to install & instant download after your purchase. Our Magento 2 extensions can be installed easily via our composer repository. Detailed installation instructions as well as troubleshooting guides can be found in our Support Wiki. This extension is available for Magento 1 and Magento 2 and both Community Edition (Open Source) as well as Enterprise Edition (and Cloud & Commerce) are compatible. The extension is multi-store compatible and supports Magento instances with multiple websites/stores/store views. All XTENTO extensions are guaranteed not to conflict with each other. Your purchase includes free development/staging/testing license keys. The license key check in the module works offline, and does not connect to the internet (server-side) to validate the license key. In case there are any questions or doubts about conflicts/functionality, please do not hesitate to contact us. We will be happy to provide assistance. Extensions developed by XTENTO are not encrypted (no IonCube, Zend Guard, etc.). 100% of the source code is open source and not a single line of code is obfuscated / encrypted. The license key check in the module works offline, and does not connect to the internet to validate the license key. These events won't cause any issues in your Magento installation and are only used to add module specific functionality which does not affect other parts of Magento. XTENTO tries to avoid class rewrites wherever possible. When possible, observers/events are used instead. In case there are conflicts (which are unlikely, based on our experience), we will be happy to assist with solving the rewrite conflict. In case there are any questions or doubts about conflicts/functionality because of the above events/rewrites, please do not hesitate to contact us. * Fixed a bug in Xtento_AdvancedOrderStatus_Model_Sales_Order_Status_History -> "Fatal error: Call to a member function save() on a non-object..."
* Fixed code that updates the order status, drop down still showed the old status eventually. + Added ability to show and select all order statuses in "Comments History" on order view page when adding a comment to an order. Beta/no official feature/not enabled in production. * Fixed a bug caused by Magento patch SUPEE-6285 that lead to "Access Denied" screens for admins that don't have full access. - You will need to purchase one license per live/production Magento installation. - You may use one license for multiple stores or store views within one Magento installation, but will need to purchase multiple licenses for multiple Magento installations. - Need more than five licenses? Please contact us - we will be happy to provide a quote. Magento 1 and Magento 2 are two completely different systems. You cannot use one license for both Magento versions, but have to decide whether you buy the product for Magento 1 or 2. Discounted upgrade licenses are available when upgrading from Magento 1 to Magento 2. If you are not sure if you are using Magento 1 or 2, please contact us. If you're using Magento Professional Edition or Magento Enterprise Edition, please select the respective extension version below. Why are Enterprise/Cloud/Commerce Edition versions more expensive? Providing support for and maintaining excellent compatibility with niche-products like the Enterprise/Commerce Edition of Magento is more time-intensive and thus generates higher development and support cost. Your purchase includes free email support and updates for 6 months from the date of your purchase, at no extra cost. You can prolong your support and update period at discounted rates using the dropdown below. Also, renewing your support and update period after it has ended (for example two years later) is also possible at any time at just 50% of the product price. - XTENTO Installation Service: A XTENTO representative will install the extension for you in one Magento installation. Installation will be completed within a couple hours during business hours usually. - Please enter the main domain of the store you're going to use the extension on. This is the domain you use to access your Magento admin/backend. - One license is valid for ONE Magento instance/installation, which may have an unlimited amount of websites, stores and store views associated ("multi-store"). Please select your Magento version below to launch the demo. Please select your Magento version below to open the correct documentation. Existing customer? Been using this extension for Magento 1 already? Go to My Downloads to claim 10% discount when upgrading to Magento 2 today. Log in using the account that purchased the extension and look for the "Upgrade to Magento 2" button. Upgrading your extensions from Magento 1 to Magento 2 couldn't be easier: Features are (almost) identical for all extensions. For our import/export extensions, transferring the configuration is as easy as exporting your configuration from Magento 1 and importing it into Magento 2 using the "Tools" section of the extensions. It's super easy and everything should work almost the same as it did for Magento 1. Got questions? Get in touch with us. We look forward to helping. Back to Product Claim Upgrade Discount at "My Downloads"
We offer a broad range of services that can be added to your order. Don't want to deal with installation or configuration yourself? Our support staff will be happy to help. XTENTO Installation Service: A XTENTO representative will install the extension for you in one Magento installation. Installation will be completed within a couple hours during business hours usually. Other consulting/customization services can be purchased on demand. Think you'll need more than a couple hours of consulting/customization time? Please contact us to request a quote before your purchase. Already purchased the extension or not sure yet if you'll need help? No worries - you can still add any of the services at a later point, after the initial extension purchase. Click here to purchase services without needing to re-purchase the extension. Included with every purchase at no extra cost: A well-designed and reliable open-source (not encrypted) product, developed by Magento Certified Developers, as well as free e-mail support with an average response time of one hour during business hours.